I grew up in Leucadia, a coastal town near San Diego where surfing is a religion. For me, it started as an alternative to smoking pot or listening to my parents fight. My first board came out of a neighbor’s trash can and my first blister came from walking barefoot to the beach. Paddling through the waves taught me to be strong, to fight discouragement, to persevere. Learning to ride waves was an exercise in patience, humility, and focus. Eventually I was rewarded with the unadulterated rush of racing down the face of a wave, my chest pumping with what surfers call “stoke” — a singular mix of meditative calm and adrenalin joy. Riding a wave, be it 3 feet or 13 feet, is a humbling, beautiful experience, and after a time the ocean became my teacher, friend and second home. When I became a land-locked Portlander three years ago, I felt a little empty. As beautiful as Portland is, there is no substitute for the Pacific. So when my friend Paul Thibodeau planned an adventure-philanthropy surf trip to Nicaragua through Roadmonkey, I didn’t even bother to check my bank account before packing a suitcase. When we arrived at the Soma Surf Resort in Las Salinas, I immediately bonded with Soma’s co-owner and surf instructor, Bill Morton. A former Californian, Bill grew up surfing the same breaks as me, and we shared the same enthusiasm for the sport. He proudly showed me his board collection, and gave me the pick of the litter. Unfortunately, I was the only one in my group with any surfing experience. We went for lessons to a nearby beach called Astillero, where the waves were small and broke near shore. Learning to surf involves more flailing and falling than actual wave riding, so it was safer for people to learn in the shallow whitewash. 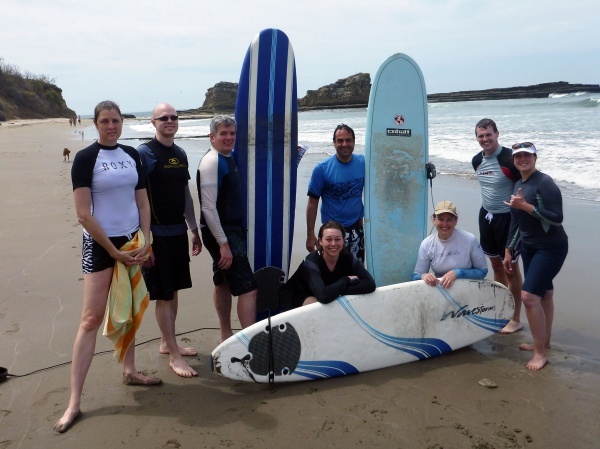 Roadmonkey expedition team members learning to surf in Nicaragua. Paul tried standing on his first wave and immediately fell. His friend Todd took off on a larger wave, nosedived his board before he could stand, and face-planted into the water. Both of them emerged with a huge smiles. Success, in surfing, is measured in seconds, and with each wave my friends became more addicted to the challenge of standing on their surfboard just one moment longer, of riding just a little further, and every attempt was met with cheers and encouragement. Paul Thibodeau catching his first wave. I had a few short rides, but mostly I helped teach my friends about wave physics and when to paddle. It felt good to be in the water again, but Bill could tell I was more than eager to explore a few miles down the coast, home to one of the world’s most beautiful waves: Popoyo. 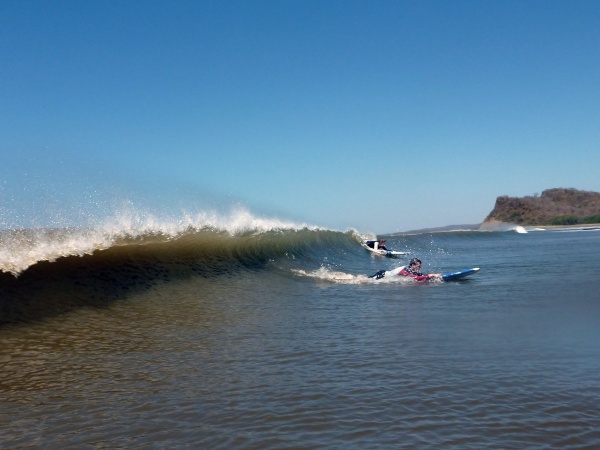 Popoyo is a reef break that helped put Nicaragua on the surfer map: a world-class wave with near perfect conditions year round. One night after dinner, during our 8-day Nica expedition, Bill pulled me aside and said that if I were willing to wake up at 4:30 am, he’d take me to Popoyo personally, free of charge. I was suited up at 4:35. After a bouncy 20-minute truck ride, the trees parted and I had my first glimpse of Popoyo. Perfectly shaped, five-foot waves rolled into shore; an offshore wind sprayed water off the crests in rainbow-dappled arcs. The ocean shimmered gold in the light of the rising sun. What’s not to like? The Popoyo surf break on a March morning. Boards in hand, Bill and I skipped down to the shoreline. I paddled through the channel watching surfers whoop and holler as they rode past me. 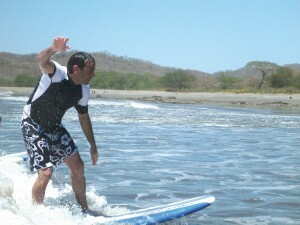 It had been years since I surfed, and I had never ridden a wave in a foreign country—suddenly I was nervous. The seabirds were different species than I was used to seeing, and the water had a different taste. As I sat on my borrowed board, waiting for the next set of waves to roll through, I thought about the sharks that were probably swimming beneath me, and how none of the other surfers were speaking English. I realized I was 3,000 miles from San Diego in totally unfamiliar territory. Bill shouted at me, interrupting my jitters, and pointed toward the horizon. A swell was surging toward us and none of the other surfers were going for it. I turned to paddle. As the peak crashed, it threw me forward down the face and I popped to my feet, engulfed in foam. I pulled out into the curl and heard Bill cheering behind me. Water sprayed in my eyes and my toes dug into comforting feel of the surfboard’s knobby wax. I carved up and down the familiar glassy surface, my nerves a distant memory. At the end of the ride I was overwhelmed with that old, familiar feeling of excitement and relaxation. Laughing, I pitched myself off the board and tumbled into the whitewash below. I paddled back out to a grinning Bill, who described my ride from his perspective, detailing how I “shot out of the foam like a bullet.” Laughing, he asked if I was stoked. Truth was, I was more than stoked—I was home. Maya Seaman is a writer with too many hobbies and an insatiable wanderlust. She completed the Nicaragua adventure philanthropy expedition in March 2013. 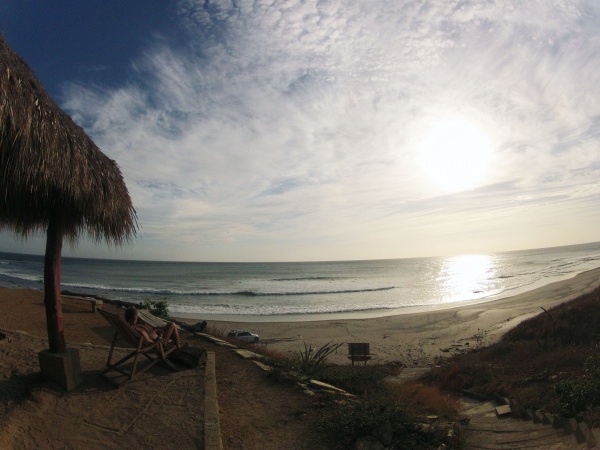 This entry was posted in Smart Risks and tagged adventure, beaches, Central America, expeditions, Maya Seaman, Nicaragua, Popoyo, Roadmonkey, stoke, surf, surfing, travel, vacations, waves. Bookmark the permalink. Follow any comments here with the RSS feed for this post. Trackbacks are closed, but you can post a comment.